If worldwide surfing community has a single center of gravity, it is probably Ehukai Beach Park on the North Shore of Oahu in Hawaii. Here is the famous Banzai Pipeline, a reef break which sends waves, surfboards and surfers one direction (the Pipeline) or the other (the Backdoor). 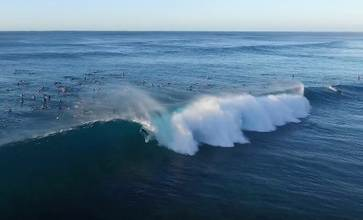 It's a thrilling yet extremely dangerous spot, and it's captured beautifully by drone in this epic drone video by top contributor and Hawaiian native Ryzone. Description: Another perfect day shooting world famous Pipeline and Backdoor.